Like most university students I have come to thrive on coffee. Whether I’m trying to survive a painstakingly long class, pulling an all-nighter or battling the odd hangover, I am always on the lookout for a great cup of coffee that will keep me going through all of my endeavors. So when I heard about the latest addition to the Montreal coffee scene, I knew I had to check it out. Starting December 1, Dispatch Coffee is giving a whole new meaning to the phrase “grabbing a quick cup of coffee.” The company is taking a new spin on the food truck idea with a unique mobile espresso bar concept. The truck will be serving high quality, delicious coffee, baked goods and catering services. There will be an array of coffee beans from around North America, including Phil and Sebastian Coffee Roasters from Calgary, and Montreal-based Kittel Compagnie de café. Different roasters will be featured during different seasons to ensure the best beans are available year-round. 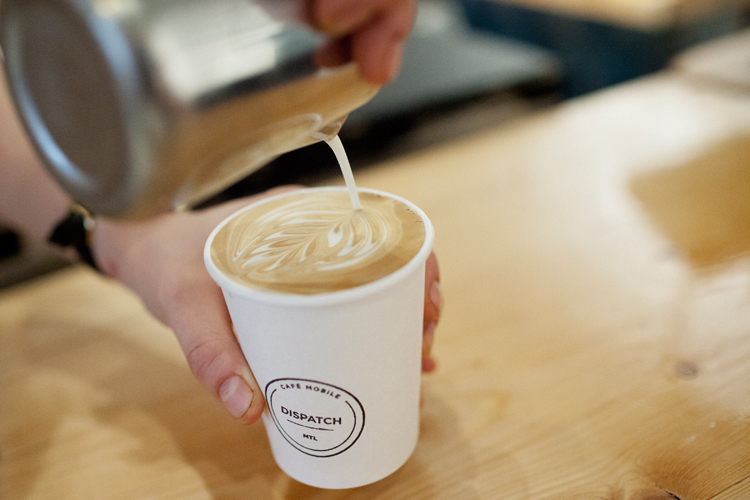 Dispatch Coffee is a refreshing new company, in more ways than one. From their original idea of making the comforting ambiance of a cafe mobile to their sensational and interactive website, Dispatch Coffee is creating quite a buzz in Montreal. But what makes Dispatch Coffee so special? The company focuses heavily on the quality of their products. They only source beans that have been roasted and farmed with intense care to maintain quality control. Along with quality, the experience itself is reason enough to try Dispatch Coffee because there is a particular novelty to a mobile espresso bar. The idea for the mobile espresso bar came bloomed from Chrissy Durcak, owner of Dispatch Coffee. She had worked at cafes for a few years and this summer while she was delivering coffee she had the neat idea for a mobile espresso bar. Not only can you get a delicious cup of coffee on the go, Dispatch Coffee also offers a selection of pastries from talented local pastry chefs. The pairing of coffee and baked goods is a classic idea, but Dispatch Coffee tries to keep their products creative, local, and exciting. While the entire menu is mouth watering, Durcak recommends the speculoos cookie coupled with an espresso. This winter, Dispatch Coffee will have a pop-up shop cafe, keeping their employees and customers warm during the harsh Montreal winter. The truck will be parked indoors at the Nomad Nation and there will be signs pointing to its location. Dispatch Coffee is also looking to expand their locations this Spring so stay tuned and watch out for their truck! Whether you love coffee or need coffee, be sure to check out this new and one of a kind addition to the Montreal coffee scene. As of December 1, Dispatch Coffee will be located on 129 Van Horne Ave. until further notice.